The announcement was made during the official Champion Canterbury Awards function at the Canterbury Club on Thursday 22nd August where New Zealand’s Governor General, Lieutenant General Sir Jeremiah “Jerry” Mateparae GNZM QSO was the guest speaker. We were nominated by the business community and judged by 30 business leaders. Now widely recognised as the premier business Awards in New Zealand, the Awards Ceremony is being held on the 2nd of October at the CBS Arena. It is expected there will be 1150 people attending this black tie event. The necessity to relocate our main manufacturing plant gave rise to a number of alternative business plans however our loyal and steadfast local workforce weighed heavily on a renewed 10 year commitment to our Christchurch staff and the wider Canterbury community. We recognise that it is our staff that contribute greatly to our high levels of product quality and service that is enjoyed by our dedicated Nationwide Dominator & Garador dealer networks and have taken this opportunity to incorporate modern “Lean Manufacturing” methods & philosophies, into the business through training and on-going education of our team members. 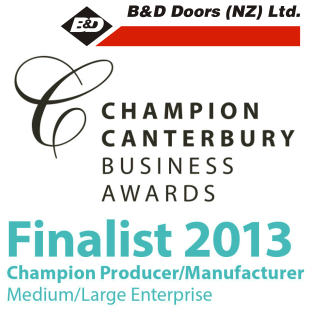 The Champion Canterbury Business Awards are New Zealand’s largest business awards and to make it this far is a great honour.